The sheep are just four of 13 clones Sinclair shepherds, but they're the most famous because of their relation to Dolly, the sheep that made headlines two decades ago as the first successfully cloned mammal.
" 'Sister clones' probably best describes them," Sinclair says. "They actually come from the exactly the same batch of cells that Dolly came from." Recently, Sinclair and his colleagues celebrated the sister clones' ninth birthday, which, he explains, would be like the 70th birthday of a human. 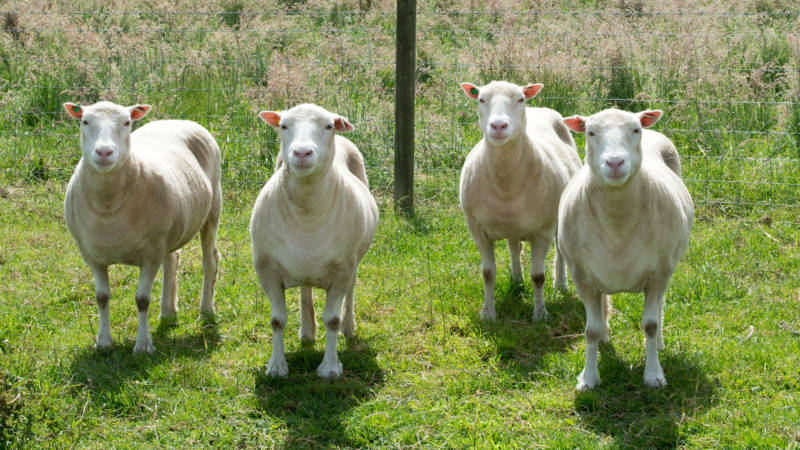 In an article out Tuesday in the journal Nature Communications, Sinclair and his colleagues write that the ewes' age, along with their strapping health, might be a reason for people to start feeling more optimistic about what cloning can do. Dolly's life did not turn out as scientists in the cloning field hoped it would. She died young — six-and-a-half — with a nasty lung virus. "That was really just bad luck," Sinclair says, and had "nothing to do" with the fact that Dolly was a clone. But she also bad osteoarthritis in her knees and rear hip at a surprisingly early age and the tips of her chromosomes were short — both signs that she'd aged more quickly than a normal sheep. "That sort of threw fuel to the fire and strengthened concerns that clones might be aging prematurely," says Sinclair. Because clones like Dolly were derived from the cell of an adult animal, the thinking went, her body might be set to an older clock from the start. It was a daunting concept for those in the cloning field, because, says Sinclair, "If you're going to create these animals, they should be normal in every respect. They should be just as healthy as any other animal that's conceived naturally. If that is not the case, then it raises serious ethical and welfare concerns about creating these animals in the first place." But, the good health of the 13 clones in the Nottingham herd suggest better prospects for the procedure. Sinclair and his colleagues evaluated the animals' blood pressure, metabolism, heart function, muscles and joints, looking for signs of premature aging. They even fattened them up (since obesity is a risk factor for metabolic problems including diabetes) and gave them the standard tests to gauge how their bodies would handle glucose and insulin. The results? Normal, normal, normal. "There is nothing to suggest that these animals were anything other than perfectly normal," says Sinclair. They had slight signs of arthritis (Debbie in particular), but not enough to cause problems. "If I put them in with a bunch of other sheep, you would never be able to identify them," he says. The scientists haven't investigated the length of the animals' chromosome tips, called telomeres. That will have to wait until the animals die, so scientists can get cells from a variety of organs. But Beth Shapiro, an evolutionary biologist at the University of California, Santa Cruz, says the results of this study are already plenty exciting. "It provides another boost to those of us who are hoping this technology might someday be useful for conservation," says Shapiro, who recently wrote a book called How to Clone a Mammoth: The Science of De-Extinction. She's one of the scientists interested in cloning endangered animals to keep them from dying off, and also hopes to – maybe -- rescue species that have already gone extinct. For example, if biologists noticed that the population of an important species was plummeting toward extinction, and that its absence would likely cause a cascade of changes to the ecosystem, the researchers might consider cloning the animals to help boost the population back up to sustainable numbers. "This science is showing us [that] if we can get by what we know is the trickiest and least efficient part of this process, then the clones that are born are, in essence, just like anything else that's alive — perfectly healthy and perfectly capable of living to old age," says Shapiro. As for the sheep clones in his care, Sinclair says "they will continue to lead normal sheep lives." Once they reach the ripe old age of about 10, they'll be euthanized and the researchers will do a detailed post-mortem analysis of their bodies.